Meridian collaborated with the National Art Museum of China and the Chinese Ministry of Culture to produce Out West: The Great American Landscape. This exhibition included 68 works by 50 American artists depicting the American West—Montana, Utah, New Mexico, Colorado, Texas, and Arizona. Work was selected to highlight the culture as well as the dramatic landscapes of the West. 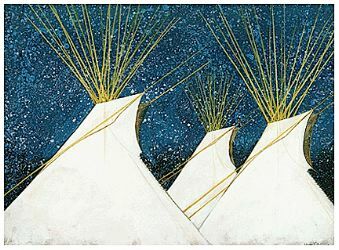 Artwork from well-known Western artists including Dana Boussard, Russel Chathan, William Matthews, Dan Namingha, Howard Post, Kevin Red Star, and Donna Howell-Sickles was included. Out West was part of a U.S.-China cultural exchange that also included Ancient Threads, Newly Woven, an exhibition about China’s Silk Road regions. Out West was on display in Washington, D.C., Beijing, Ürümqi, Xi’an, and Shanghai. Major sponsors of Out West included American Airlines, Anheuser-Busch Companies, FedEx Corporation, and Tyco International. The Chinese tour and catalogue publication were made possible by the National Art Museum of China.